This weekend just past was Canadian Thanksgiving, and there were many things for which to be thankful. The weather was extraordinarily nice - I put a chair into Lake Huron and just sat in the water one sunny afternoon. This is not something you can do every Thanksgiving, unless you have a good drysuit! 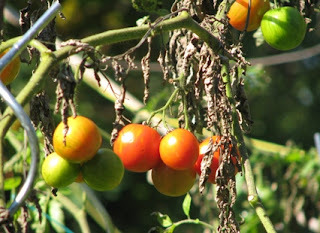 It was harvest time for the last tomatoes on the vine, still gradually ripening in the mild warmth. I also dug up almost the last of the Russian Blue potatoes I planted this spring. They had bloomed abundantly and set many seed pods, looking a bit like purple-green cherry tomatoes but with a much firmer texture. 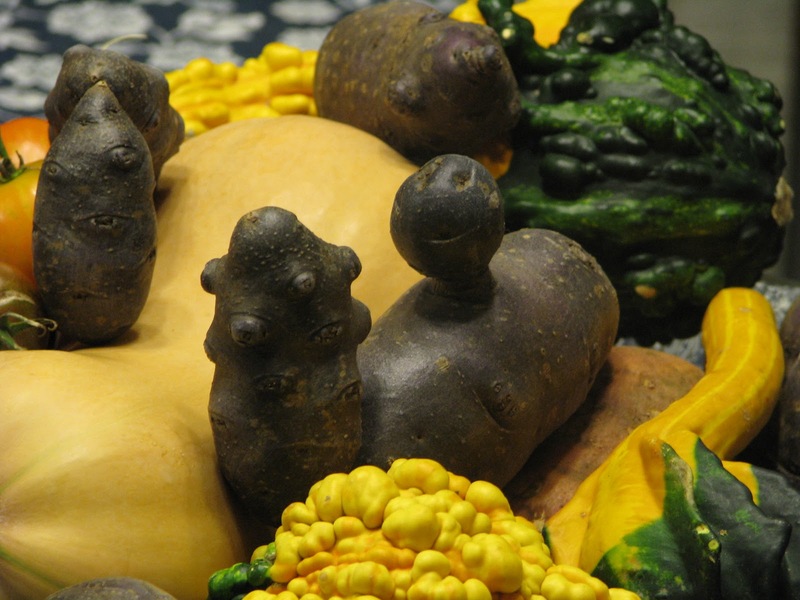 The parent tubers were a revelation - engagingly warty, blobby, and just generally eccentric. 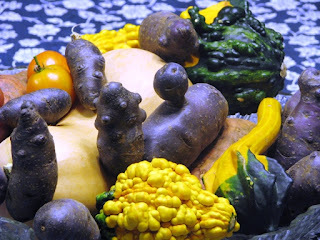 It seemed like the only thing to do was to arrange them along with the purple cherry tomatoes and some amazing gourds in a vegetable bestiary. The insides of the Blues are lighter towards the edges and darker in the centre. Boiling reduces the colour but slicing thinly, tossing in olive oil with a bit of salt and thyme, then baking in the oven (mixed with Yukon Gold slices, also from the garden) produced a colorful treat in much less time than boiling or baking would have taken. 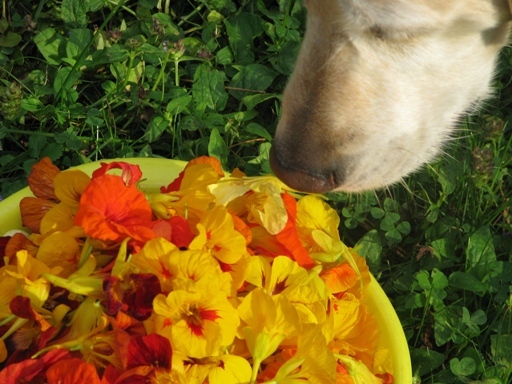 Another super-abundant vegetable crop in our country garden this year is nasturtiums. They looked quite beautiful as an underplanting below the 8-foot tall tomato vines. But beauty wasn't all that was on the menu. We experimented with uses for the peppery flowers and leaves, in salads, omelettes, and stews. I remember particularly being at table with some not very gourmet friends and their children and passing around the flowers as a snack. "Eeeew!" 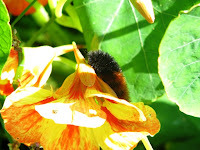 was the general response, before any flower was tasted. So, I led a small tasting session by pointing out that the long spurs that stick out behind the flower are where the nectar is stored. A bite of just the spur is a delectably sweet sip of what butterflies, bees, and hummingbirds already know. But I had so many flowers that I needed new uses. That's when I found recipes for nasturtium butter. This lovely condiment adds the colours and mild peppery flavour of nasturtiums to small butter logs which can be saved and used on fish, vegetables, or baked goods. I enjoyed the recipes here or here. Just gathering the ingredients was an exquisite task. Our puzzled dog, who is not as fond of vegetables as we are, wondered what the fuss was about. Well, that's all for today from me. We need to get some other Hort members on the blog, so the next post will be from Barbara Japp, about moving from a house and garden to an apartment and garden. Looks like you had a nice little harvest and all your crops came out lovely. Hope to see more vegetable related posts from you soon. Post more tips please. I do prefer eating vegetables a lot so first of all I really want to thank God for giving us vegetables to fulfill our requirements of proteins and carbs.